Today's entry saw one of my favorite writers collaborating with two of my favorite comic creators. They brought to life one of the writers best short stories in graphic novel format. 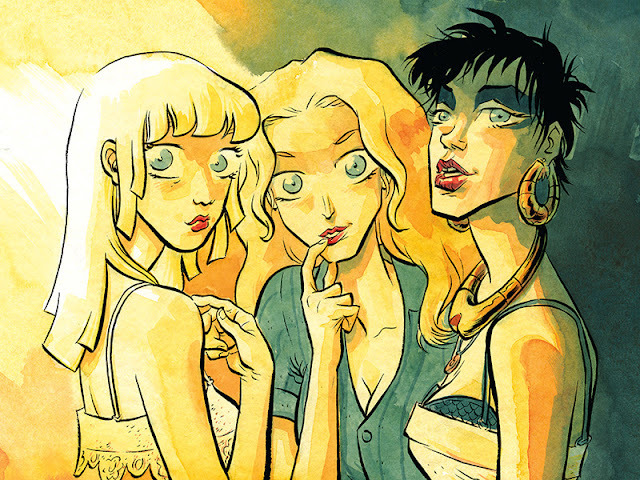 How to Talk to Girls at Parties is a short story by Neil Gaiman that was adapted by Brazilian comic duo Gabriel Bá and Fábio Moon. I've loved their work since discovering the magnificent Daytripper a few years back (seriously, one of the best graphic novels ever), so this was a team-up that was always going to delight me. It's a wonderful adaptation of the original story, and manages to capture all the weirdness and magic of the source material. If you have read the original story, you know this was far from an easy tale to translate into a visual format. It's a little hard to describe without ruining some of the magic, so I'll just encourage you to see it out for yourself and let you discover it for yourself. Then go buy Daytripper, seriously, you won't regret it!